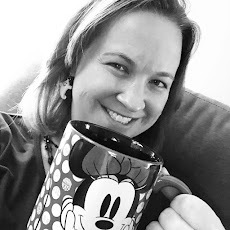 If you are a Disney loving parent with a Disney loving preschooler at home, you have probably memorized just about every Disney Junior episode out there. From Mickey Mouse Clubhouse to Jake and the Neverland Pirates to Sofia the First, these shows captivate the hearts and young minds of children - and I'll admit - even are fun for the adults to watch too! When planning our trip to Disney with Brody, we knew that anything Disney Junior was a must do. That meant that breakfast at Disney's Hollywood Studios Hollywood and Vine Restaurant was a no brainer! Brody dressed as Jake for his breakfast! 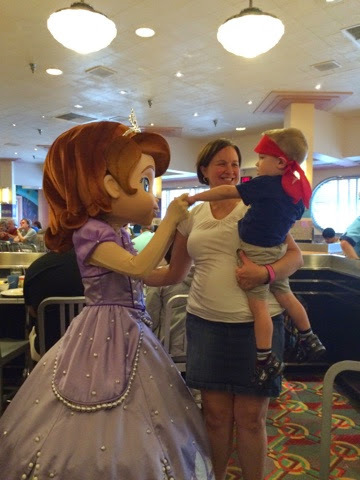 Each day, Hollywood and Vine offers Disney Junior Play 'n Dine for breakfast and lunch. Similar to most other character meals, this is once again a buffet. And since we were there for breakfast, it was again similar to what you would expect to find on breakfast buffets. . .Mickey waffles, scrambled eggs, meats, fruits, yogurt, etc. The food was good and hot, but it's the entertainment here that you don't want to miss if you have a Disney Junior fan in your house. 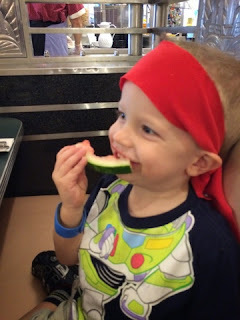 Enjoying a piece of watermelon while watching the characters around the restaurant. This breakfast had the best character interaction I've experienced at a character meal in my time at Disney. I know that some of this can vary day to day depending on the staffing at the restaurant, but I feel that the Disney Junior Play 'n Dine recognizes that they are catering to an impatient audience that doesn't sit well for long periods of time. There were more dance and party breaks then I care to count and each one featured the characters actively engaging with the kids as they danced and sang along to their favorite Disney Junior songs. 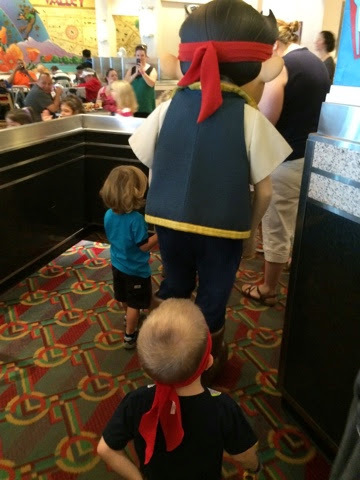 Marching around the restaurant with Jake- pretending we were pirates! Arghhh! The characters currently featured there (as of November 2014) are Jake, Sofia, Doc McStuffins, and Handy Manny. 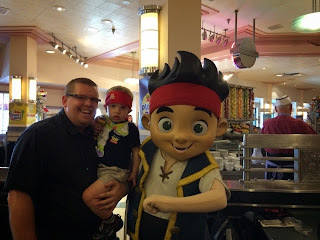 Brody is not a Handy Manny fan, but was thrilled to meet everyone else. In fact, he spent the rest of the day commenting on how pretty he throughout Sofia was! We didn't get a chance to have Doc McStuffins visit our table because we had FP+ reservations for the Frozen Sing-A-Long show at 10:15 and the earliest time I could get for our breakfast reservation was 9:15. This is one character meal that you definitely want to plan for the full 90 minute experience. With the dance breaks and extensive character interactions, the characters take their time making their way through the restaurant - which I appreciate. Jake visited our table to say hi! "Why yes Princess Sofia, you may kiss my hand!" 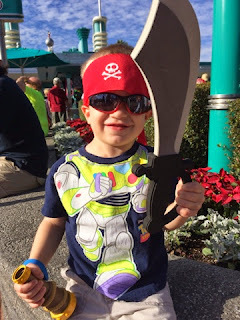 This is a character meal you don't want to miss if you have a preschooler traveling with you to Disney on your next trip! Enjoy the fun, music, and laughter as the kids have a great time! !